Another famous example of a large fine gardening landscape is Butchart Gardens on Vancouver Island in British Columbia, Canada. The garden has become a travel destination for garden enthusiasts from around the world and is instructive for the influence it exerts on garden design thinking far from its temperate location in zone 8b of British Columbia. 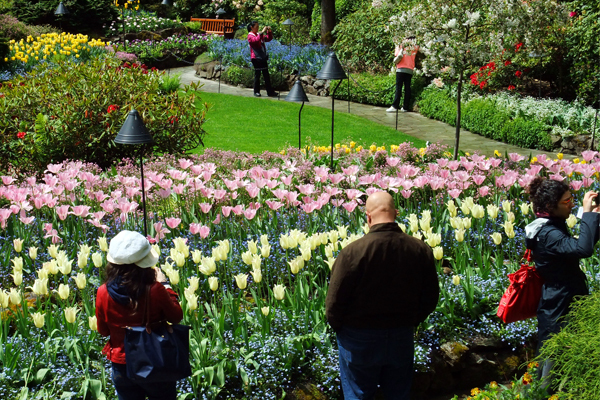 The spectacular displays at Butchart Gardens are made possible by the annual planting of over 300,000 non-native bulbs—geared for a three-week display in April and May. The display, following time-tested rules for plant combinations, combines annual bulbs with rhododendrons, flowering trees, and blooming perennials to create scenes like the one shown in figure 2. While Butchart Gardens can be appreciated for its aesthetic achievement, it is problematic in that it sets a standard for ornamental display gardens that reverberates throughout North America, and throughout the world. Figure 3 shows the display garden at the Dallas Arboretum and Botanical Garden in Dallas, Texas, designed to compete on the international stage with gardens such as Butchart, but in an area with a much less temperate climate. So many bulbs and other plants have been planted and so many soil amendments added that the entire 66-acre arboretum no longer has any native soil and is “like one giant pot” according to their former director of horticulture. This garden, influenced in concept by other display gardens, is a big educational resource for the many wealthy homeowners who live in the North Texas metropolitan area. Visitors receive a tacit education in an aesthetic that they often emulate in their home and business landscapes. This transfer of values is reinforced by the types of plants tested in its trial gardens and by volunteer opportunities that reinforce the intensive gardening practices. The economic elites that are influenced by the Dallas Arboretum produce home landscapes that are often featured in popular gardening magazines and pass on the resultant aesthetic priorities to an ever larger proportion of the population. Additionally, the wealthy patrons of the Dallas Arboretum are both influenced by and exert an influence on the direction of the organization in a self-reinforcing loop that is encouraged by the horticulture industry. 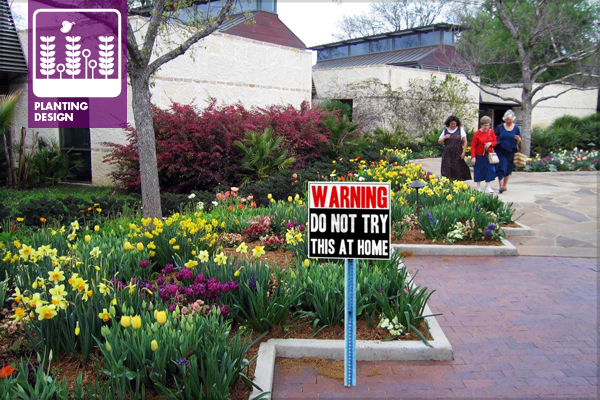 A more sustainable approach would be to educate the public that the Dallas Arboretum is an ‘art museum for plants,’ designed to be appreciated as a public place and not as a landscape model for North Texas. The plant trials at the Dallas Arboretum are good indicators of the priorities used to develop their fine gardening plant palette. These priorities are skewed to focus entirely on aesthetics with little consideration of environmental concerns or ecology. The four criteria evaluated are display, uniformity, leaf color, and vigor. It is assumed that all horticultural considerations can be mitigated, with the possible exception of temperature. The Dallas Arboretum sends out breathless e-mails several times a year and promotes results of its trials on its website. For example, in 2015 the Arboretum promoted Lobelia erinus ‘Techno Heat’ as a four week cool season annual in the temperate weather between winter annuals and the installation of summer annuals for the hot summers in North Texas. All of the financial and environmental resources required for growing, transporting, and installing the plant are designed for a ‘life cycle’ of less than two months geared towards a spring color display. The misleading label in their promotions of “Trial by Flower!!! If we can’t kill it no one can” makes it appear that the plant is being tested for adaptability when, in reality, adaptability to the regional climate is not a consideration in the trials for this plant (the full list of summer annuals recommended by the Dallas Arboretum can be found on their website). The ethos of seasonally replacing annuals as the climate changes throughout the year, and using species that will only survive with large amounts of soil amendments and extra water, is reinforced by certain sectors of the horticulture industry. I attended a plant introduction symposium held at the Dallas Arboretum sponsored by a company called Plant Development Services, Inc. About half of the attendees were landscape architects and the rest were from various sectors of the horticulture industry. Plant Development Services introduced the Southern Living™ Plant Collection and handed out a very well-produced binder with talking points for retail distributors and for designers to help with marketing the plants to their clients. The Collection was developed in a region of acid soil ranging from the Southern Living headquarters in Birmingham, Alabama, to experts at the University of Georgia in Athens, Georgia, and shows the fallacy of creating a national plant palette using experts and resources from one particular region. Most of the Southern Living™ Plant Collection is composed of exotic hybrid species that can only grow in acid soils and that require moist and well drained conditions. However, the North Texas region has only alkaline and small areas of circumneutral soils and most of the soils in the area are heavy clay and drain very slowly. Every page promoting a plant at the introduction had the statement “Athens Select™ have been tested by Dr. Allan Armitage at the University of Georgia, and selected for superior performance in extreme heat and humidity. Purchase of these plants helps support university research programs” (Southern Living™ Plant Collection printed information on individual plant species, 2009). 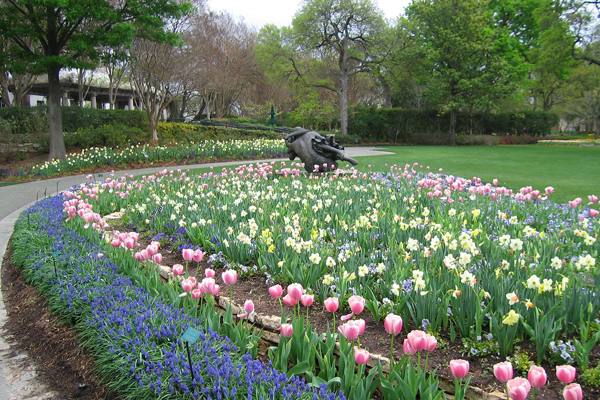 The introduced plants had the imprimatur of the Dallas Arboretum (having been introduced by their director of horticulture), the very popular Southern Living Magazine, and the research of the University of Georgia. As a result, the attendees of the introduction seemed to be sold on the palette even though most of the plants are very poorly adapted to North Texas and require vast resources to create the horticultural conditions that would make their survival possible. It is easy to understand how a lay person who is honestly seeking horticultural advice could be as convinced as the attendees seemed to be and would heed the advice to both buy the plants and to expend the monetary and environmental resources required for their success. Another environmentally destructive horticultural practice tied to fine gardening is actively promoted by Plant Development Services and their Encore Azaleas brand. The company still advocates the addition of Canadian sphagnum peat moss to North Texas soils in order to make the soils compatible with the needs of these very poorly adapted exotic plants. According to a biogeochemist quoted by Scientific American, “Peatlands only cover about 3 percent of the Earth but they accumulate more carbon than tropical rainforests.” These carbon sinks, that have been sequestering carbon for over 500 million years, are mined for the soil amendment that makes growing Azaleas possible in North Texas. Additionally, 80% of the peat that is used in the United States is shipped from Canada which greatly increases the carbon footprint of the material. It is time for all landscape architects to remove from their specifications the destructive environmental practice of using plants that require peat moss and past time for Arboreta to still permit companies to actively promote the practice at symposia and plant promotions at their facilities. The focus by the fine horticulture industry and enthusiasts on exotic, poorly adapted hybrid plants and a ‘no holds barred’ acceptance of environmentally destructive practices such as soil amendments from distant locations is represented in figure 1. All plants provide some environmental and ecological services, however inadvertent, so this has been indicated. It is also possible to undertake fine horticulture using organic methods rather than chemicals. While highly preferable, this is still a very resource intensive undertaking as the organic soil amendments and pesticides required for success must be manufactured, transported, and installed with the resultant pollution and large carbon footprint an unavoidable consequence. The purpose of this post is not to encourage the elimination of resource intensive fine gardening landscapes. These landscapes should, however, be like a ‘dessert’ and never the ‘main meal.’ Having small, highly visible, and intensively used areas of a landscape as a showplace for the art of fine horticulture need not necessarily have a large effect on the environment or ecology of an area, as long as we understand it as an aberration and not as a standard practice for large areas. A good analogy can be found with low mileage, high horsepower sport cars. I enjoy seeing an occasional Ferrari, or Hennessey—full disclosure, I even watch Top Gear! However, if you look in my garage, you will find two hybrids. 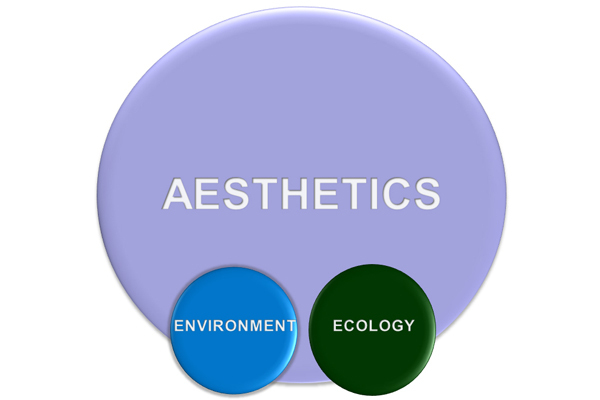 Next month’s post will discuss a more mainstream and cost effective green industry plant palette that is still very popular with both landscape architects and with homeowners, as we gradually move towards the goal of a balance of aesthetics, environment and ecology with a palette of aesthetically qualified native polycultures .